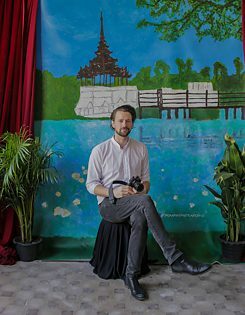 An interview with Lukas Birk "Burmese Photographers"
While the photographic history of the colonial period was extensively documented, the Burmese photographers and their photographs remained unknown. Tracing the emergence of an autonomous Burmese imagery, the artist and photographer has searched the hidden archives of antique dealers and photo studios, and founding the Myanmar Photo Archive. In his book “Burmese Photographers”, which has been published in Burmese, he presents a selection of these photographs and their history. Based on his book, he has also curated an exhibition, which has been open to the public since the 18th of February. A selection of these photographs are now to be seen in the historical halls of the Secretariat in Yangon from the 18th of February until the 11th of March. In the historical halls of the Secretariat in Yangon, the visitors are taken on a journey through the photographic history of Myanmar. The Myanmar Photo Archive collection contains over 10.000 photographs which you have collected. Can you tell us a little bit about how and where you discovered these photos? When I started collection it wasn’t really that difficult because nobody had done so in the past. Second hand dealers were sitting on piles of decaying photographs and albums. Mostly salvaged from abandoned or destroyed houses. Other images I got directly from photographers and photo studios. If a studio still has negatives from the past it is especially interesting as these images can be traced to a specific area and the people that lived there and how they liked to be presented in the photographs. Photography came to Myanmar with the British at the turn of the century. What has changed in Myanmar photography after the end of colonization? Curator Lukas Birk | © Lukas Birk Already with the early foreign photographers, weather British, German or Italian there were assistants and other local people involved in photographic production. But the studios and photography economy circled around the foreign needs – only few local people had the financial means to be photographed, photograph themselves or have a usage for image making at large. Although there were numerous Myanmar owned studios in the 20s and 30s the aesthetics and economy was still highly dominated by the foreign image makers. This changed after the second world war and especially after independence when bureaucratic changes were in high demand of photography. The prices for photography had also dropped substantially and allowed many more people to go to photo studios or even take up photography themselves. How can the impacts of the military rule be seen in these photographs? The change in government structure after 1962 can especially be seen in how photo journalism and documentary photography had developed or not developed. The restrictions on photographic material imports and the nationalization of most industries (including photography) lead to a huge shortage of supplies. By the 70s there was a large amateur photography scene in most countries – this was rather restricted in Myanmar as it was almost impossible to obtain films, chemicals or cameras for the regular non - professional. Illegal imports thrived as well. Today Facebook is a big hit in Myanmar. Is there a connection between the way people post pictures today and how photographs were consumed before? © Lukas Birk There are certain connections to the past for everybody. 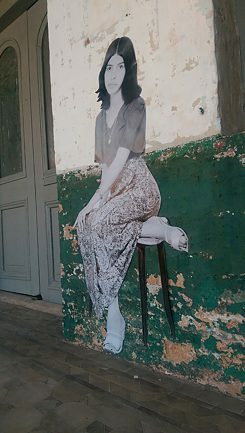 How we construct pictures has to do with how we perceive pictures and old photographs are all around us and influence us. But most young Facebook users have never held a camera in their hand. The phone is everything in one and so the basic form of taking a photograph has been skipped. This can be said about most countries now or in the near future though. What makes this book and the exhibition so unique and relevant today? Looking at the immediate or distant past might not be very popular in Myanmar right now. Looking forward is of course very important but there will be a time, I think, when people will feel a need for the past. Even if it is from a period that some want to forget. This project (the Myanmar Photo Archive) is presenting a glimpse of the wonderful photographic history this country had. Something that has not been attempted before. And though the project is not complete or as comprehensive as it should be it is a starting point and hopefully an inspiration for many researchers, historians or artists to come and do better. Surely, you must have come across many strange and fascinating stories while collecting these photographs. Can you share with us your favourite? I am certain to say that working with older crafts people or antique dealers that spend their whole live digging through the past makes for great characters and stories. When I started the project in 2013 I walked through downtown for days trying to find older photographers who could tell me anything interesting from the past. I came across this gentleman who repaired cameras on the street near Shule Pagoda - he told me the most fascinating stories about how he worked for foreign embassies in the 70s and 80s as secret photographer and as well for foreign press, how he had never been caught and was responsible for some big headlines in Western Media but when I asked him for his name and if I could do a formal interview with him he accused me of wanting to bring him behind bars and that maybe I am spy. He packed up his things and left. I have seen him several times since as he has a small stall now but he either doesn’t remember me or ignores me.